Happy Feast of the Epiphany!! Linking up with Fine Linen and Purple. We actually went to Mass last night, because the forecast predicted all sorts of craziness for today. I lived in Michigan for years before I was married, but even I had to concede that I wouldn't want to venture out in this morning's weather! Much cozier when viewed from behind the panes of the windows of a nice, warm house! I finally figured out yesterday why I struggle with the Christmas season so much. It occurred to me because I've been really having a hard time lately with the fact that Sister Nugget is growing up so fast. Sister Stinky's babyhood seemed to go slower, but Sister Nugget's is flying by, and...oh, how I wish my body were already healed from the kidney stones and overall wear and tear resulting from another HG pregnancy, but alas...it is not ready to grow another bambino yet. And so, I'm left with the reality that babyhood is an altogether fleeting and precious stage of life, and all I can do is soak it in. And so it is with the Christmas season. There is something so incredibly precious - especially now that I am a mother - about pondering the babyhood of Jesus. The Christmas season is one in which I feel such great affection for him, and one in which I feel particularly close to his mother. But it is the same sort of feeling...it is altogether too fleeting. Didn't we just start the Christmas season? I feel as if the reality is barely setting in, and already it is over. But surely, that must have been what Jesus' actual babyhood was like - sweet and yet terribly fleeting. Fleeing to Egypt in the midst of it certainly must not have helped. And so, we are left with but one choice - to accept the reality that this celebration of the babyhood of Jesus is a fleeting and precious stage of the liturgical year and to do all we can to soak it in. In the spirit of soaking it all in, I couldn't resist but to squeeze in one last gift for Sister Stinky, to celebrate the day when Jesus received his birthday gifts. So, inspired by some of the lovely handmade toys over at ikat bag, I couldn't help but whip up a few little additions (some donuts and cookies!) for the bakery corner of Sister Stinky's preschool space. Needless to say, she was thrilled! 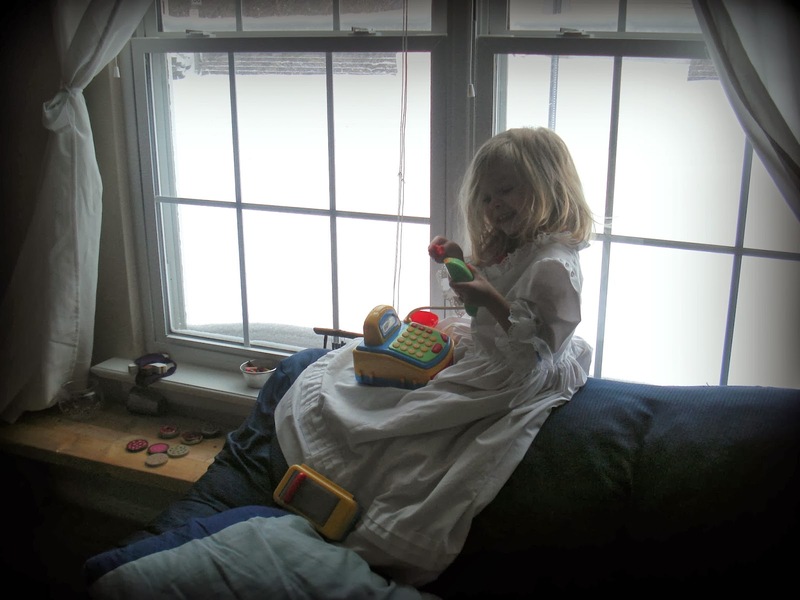 In fact, she spent the better part of the morning immersed in play in that corner of the living room. Stay warm and have a lovely Sunday! Oh my goodness, little nugget fits in the shirt already??? haha. 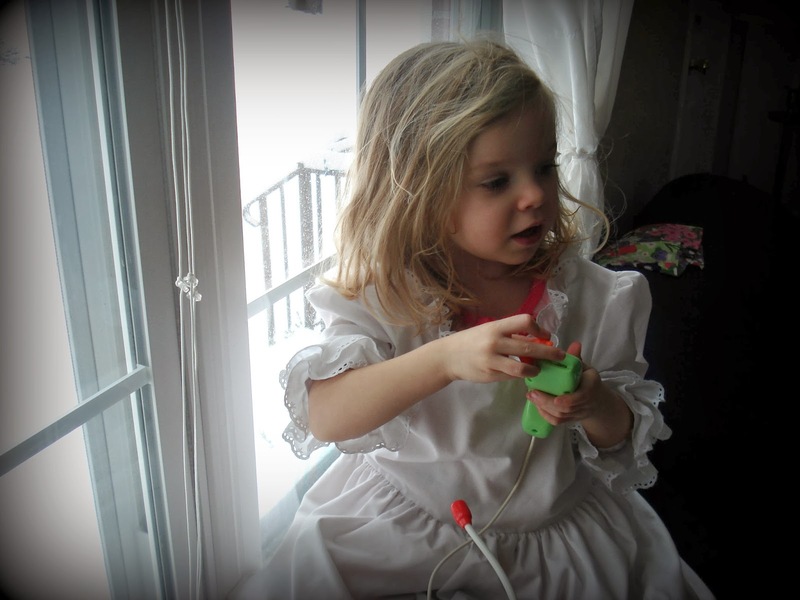 You look *so* pretty in green--love that smile:) Did you make big sister's dress too? I love it!